The REF615 is powerful, most advanced and simplest feeder protection relay in its class, perfectly offering time and instantaneous overcurrent, negative sequence overcurrent, phase discontinuity, breaker failure and thermal overload protection. The relay also features optional high impedance fault (HIZ) and sensitive earth fault (SEF) protection for grounded and ungrounded distribution systems. Also, the relay incorporates a flexible three-phase multi-shot auto-reclose function for automatic feeder restoration in temporary faults on overhead lines. Enhanced with safety options, the relay offers a three-channel arc-fault detection system for supervision of the switchgear circuit breaker, cable and busbar compartments. The REF615 also integrates basic control functionality, which facilitates the control of one circuit breaker via the relay’s front panel human machine interface (HMI) or remote control system. To protect the relay from unauthorized access and to maintain the integrity of information, the relay has been provided with a four-level, role-based user authentication system, with individual passwords for the viewer, operator, engineer and administrator level. The access control system applies to the front panel HMI, embedded web browser based HMI and the PCM600 relay setting and configuration tool. REF615 supports the new IEC 61850 standard for inter-device communication in substations. The relay also supports the industry standard DNP3.0 and Modbus® protocols. The implementation of the IEC 61850 substation communication standard in REF615 encompasses both vertical and horizontal communication, including GOOSE messaging and parameter setting according to IEC 61850-8-1. The substation configuration language enables the use of engineering tools for automated configuration, commissioning and maintenance of substation devices. The REF615 IEC 61850 implementation includes GOOSE messaging for fast horizontal relay-to-relay communication. Applying GOOSE communication to the REF615 relays of the incoming and outgoing feeders of a substation, a stable, reliable and high-speed bus protection system can be realized. The cost-effective GOOSE-based bus protection is obtained just by configuring the relays and the operational availability of the protection is assured by continuous supervision of the protection relays and their GOOSE messaging over the station communication network. Costs are reduced since no separate physical input and output hard-wiring is needed for horizontal communication between the relays. For continuous knowledge of the operational availability of the REF615 features, a comprehensive set of monitoring functions to supervise the relay health, the trip circuit and the circuit breaker health is included. The breaker monitoring can include checking the wear and tear of the circuit breaker, the spring charging time of the breaker operating mechanism and the gas pressure of the breaker chambers. The relay also monitors the breaker travel time and the number of circuit breaker (CB) operations to provide basic information for scheduling CB maintenance. Due to the ready-made adaptation of REF615 for the protection of feeders, the relay can be rapidly set up and commissioned, once it has been given the application- specific relay settings. 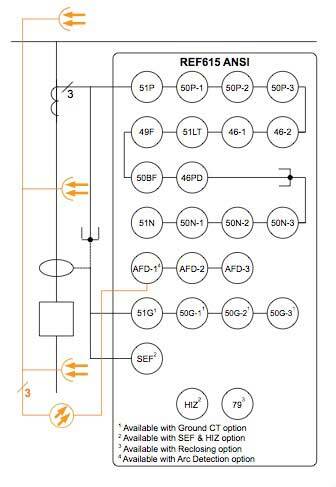 If the relay needs to be adapted to the special requirements of the intended application, the flexibility of the relay allows the relay’s standard signal configuration to be adjusted by means of the signal matrix tool (SMT) included in its PCM600 relay setting and configuration user tool. 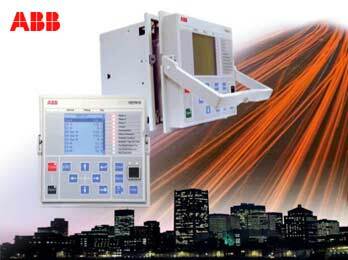 By means of Connectivity Packages containing complete descriptions of ABB’s protection relays, with data signals, parameters and addresses, the relays can be automatically configured via PCM600 relay setting and configuration user tool, COM600 Station Automation series devices, or MicroSCADA Pro substation automation system. The draw-out type relay design speeds up installation and testing of the protection. The factory-tested relay units can be withdrawn from the relay cases during factory and commissioning tests. The relay case provides automatic short-circuiting of the CT secondary circuits to prevent hazardous voltages from arising in the CT circuits when a relay plug-in unit is withdrawn from its case. The pull-out handle locking the relay unit into its case can be sealed to prevent the unit from being unintentionally withdrawn from the relay case.